These days, the real Charles Lauren is island hopping in the Bahamas with his Antilles G-21 Super Goose. It seems one could also find him telling tales (probably of weddings past) at Sloppy Joe's in Key West. Sometimes you can see him whale watching from the balcony of his house near Lahaina, and going up and down and up the Côte d'Azur with the Cranchi Atlantique 50 that he won with a very lucky hand, if you know what we're saying. Come to think of it, you'll probably be doing one of those things on your honeymoon! No, we just think that stuff is cool to do. Charles Lauren is a state of mind, not an actual person! 2. The abbreviation for Charles Lauren is CL...and CL stands for Capture Love. Charles Lauren = CL = Capture Love. 3. That's what we set out to do, so we like it! David and Kelsey started working in the motion picture industry very early - David when he was 13 at the City of Lakewood's Public Access TV station. Instead of doing homework, he would direct live TV shows about pet adoption, political shows, concerts. He would also edit, and edit. Back then it was just Linear Editing on U-Matic machines. Creating the kind of videos we create now would have been impossible. It would have taken months of full time editing to create one of our Chronological videos. Kelsey began when she was 18, working as a Associate Producer with Huell Howser on his show, California's Gold and Visiting with Huell Howser. After coordinating with some of the characters around California, how much work could a wedding be? Ya, we know, that was a funny thought. After college in 2004, they hit the ground running. Focusing their creative energies on finding the best way to use Mise-en-scène and Eisenstein's theories to tell the very personal, but universal stories of families coming together at a wedding. In 6 months they had most of the next year booked. Since then, there has never been a day when a wedding wasn't coming up to shoot and a past wedding hasn't been coming down the editing pipeline. They built systems and brought in talented shooters and editors to round out the company. There have been many offices and studios, but only to serve as great places to showcase our work - and give our clients time to see how cinema and weddings were made to be together. We want you to see how magical a wedding film can be. Through the juxtaposing of vows, toasts, conversations, music, dynamic imagery and candid moments, a new understanding of your day, your life, love and relationships appears. Come see the Difference that Love Makes for yourself! 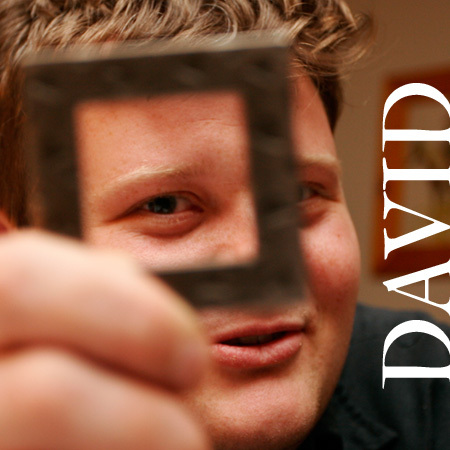 David does a lot of the shooting, online editing, mastering, digitization and keeps everything running. No down time allowed over here!